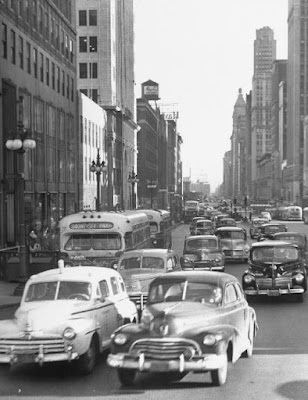 December 26, 1951 – The holidays are stressful times, and motorists on Michigan Avenue on the day after Christmas back in 1951ad ample reason to be stressed as a result of a standoff between representatives of two city agencies. Traffic policeman Phil Tolan arrests a CTA bus driver, William Wilson, at Michigan Avenue and Ontario Street in the height of the evening rush hour. It starts innocently enough when Wilson, with a green light, moves his bus into the intersection of Michigan and Ohio. You see this all the time today -- traffic is backed up and the bus blocks the intersection. Officer Tolan approaches the window on the driver’s side of the bus and tells the driver he should have waited, and Wilson closes the window in the copper’s face. “Well, I couldn’t let him sass me like that so I told him he was under arrest and ordered him to open the door and get out and show me his license,” Tolan says. [Chicago Daily Tribune, December 27, 1951] He orders the bus driver off the bus, but Wilson won’t open the door until Tolan threatens to break it. A paddy wagon is called, Wilson is taken to the East Chicago Avenue station, and the CTA is left with the task of transferring passengers to another bus and getting the stranded bus out of the intersection, a process that takes close to 45 minutes. The humor probably would have been lost on all of the motorists jammed up on Michigan Avenue that evening, but before he was a cop, Tolan drove a bus for the CTA. The photo above was taken about a half-mile south of Ontario, but you get the idea of what a 45-minute blockade of a key intersection might have been like.